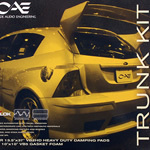 TK1 trunk kit keeps the bass inside! The TK-1 Trunk Kit offers the DIY'er a combination of high performance, lightweight V-MAX vibration damping material and VB-5, a neoprene gasketing foam. So many customers complain about the fact that after having spent a lot of time and money installing a subwoofer system, it now sounds and feels as if the trunk is going to explode. The sound pressure emanating from the speaker system causes the thin sheet metal, plastic or fiberglass panels to vibrate uncontrollably. The TK-1 Trunk Kit features six 12.5" x 30" sheets of V-MAX, a lightweight peel and stick vibration damping material that has been engineered to reduce vibration in the most extreme applications. V-MAX can be applied directly onto the underside of the trunk lid and package tray as well as onto the inside of the rear quarter panels. V-MAX is very easy to install and can even be removed and repositioned without affecting the performance of the product. Also included in the TK-1 Trunk Kit is one 10" x 10" square of VB-5, a super lightweight gasketing foam designed to eliminate irritating squeaks, rattles and buzzes. Use VB-5 to isolate tail light assemblies, license plates and frames, third brake lights, cables, harnesses, interior panels and more. By reducing vibration, you will effectively be preventing sound energy from being converted into mechanical energy. What does this mean? It means that you will experience increased output from your subwoofer system and realize all of the performance you paid for! V-MAX installed into the spare tire well of a VW Beetle. VB-5 installed behind a linkage rod to eliminate a potential rattle.